The Q450 Quadcopter Frame is very popular and mostly used Multirotor Frame by the hobbyists!!! We are providing Plastic Landing Gear with this Q450 Quadcopter Frame in this pack. The landing gear will add Crab Legs to your quadcopter. This is 3rd version of Q450 Quadcopter Frame comes with stronger material over v1 and v2, so no more arm breakage at the motor mounts on a hard landing. The arms of the frame are colored as 2 red and 2 white which can guide you to fly in the right direction. 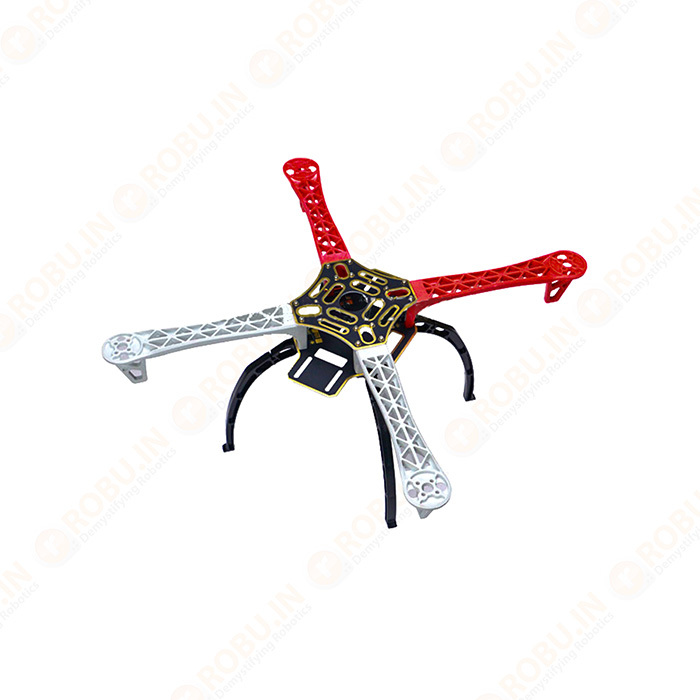 This Q450 Quadcopter Frame is made from Glass Fiber which makes it tough and durable. They have the arms of ultra-durable Polyamide Nylon which are the stronger molded arms having a very good thickness so no more arm breakage at the motor mounts on a hard landing. The arms have support ridges on them, which improves stability and provides faster forward flight. The Q450 has strong, light, and have a sensible configuration including a PCB(Printed Circuit Board) with which you can directly solder your ESC‘s to the Quadcopter. So, making the Quadcopter build fast and easy. So, it avoids the use of extra PDB(Power Distribution Board) and makes the mounting clean and neat. The Q450 Quadcopter Frame is highly flexible frame during mounting of various components like flight controller, battery etc. The frame has the wheelbase of 450mm and weighs around 320gm. It features mounting tabs at the front and rear end on the bottom plate of the main frame for mounting cameras and other accessories. The landing gear has the ground clearance of 200mm and allows the mounting of the camera and other accessories at the bottom of the mainframe. The Plastic Landing Gear can withstand sudden crashes during flying of FPV Quadcopters. The frame comes with pre-threaded brass sleeves for all of the frame bolts, so attaching the arms to the main frame is done within few minutes. Also, it requires one size of bolt for the overall build and thus a unique one size hex wrench which makes hardware mounting very convenient. This feature of Q450 Quadcopter Frames makes them so easy to assemble and disassemble. Such lighter weight, higher strength Aerodynamic structure of this Q450 frame featuring PA66 arms with glass fiber integrated frame make it the first choice of our customer. 1 x Q450 quadcopter Frame(Top and Bottom) with Integrated PCB. 4 x Q450 arms (Red+White).